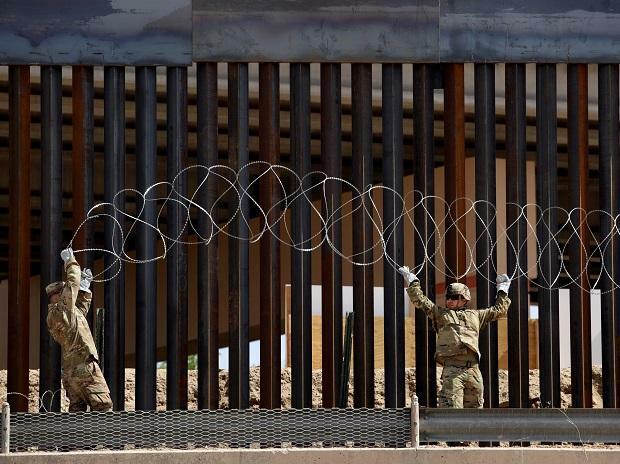 Trump sees his campaign against a "crisis" on the border as key to his 2020 reelection bid, and his trip to Calexico in California was meant to keep that message in the headlines. At a meeting with border patrol agents and other officials in Calexico, he said "it's overwhelming our immigration system and we can't let that happen." Then in a message to those heading for the United States, he said: "The system is full and we can't take you anymore.... Our country is full." "So turn around, that's the way it is," he said. Waving US and Mexican flags, the protesters carried signs with messages such as "Stop separating families" and "If you build the wall, my generation will tear it down." On the US side, dozens of people lined the road that Trump's motorcade took from the airport, demonstrating support for his policies. "Build the wall," said one placard. Before leaving Washington earlier, Trump said that his previous threats to shut down the border had been successful in persuading Mexican authorities to clamp down by stopping migrants on their journey north. "Mexico, I have to say, has been very, very good... over the last four days since I talked about shutting down the border," he said. While sounding tough, Trump's surprise shift to tariffs from the previous threat to close the border is a major retreat. In Mexico City, President Andres Manuel Lopez Obrador urged investors to "stay calm." "Our relationship with the government of the United States is very good," he said.